Wouldn`t it be nice if all the vegetables that you plant were perennials? You plant them once and then each year the same plant simply produces more. While the chances of you getting your tomatoes to do this are virtually impossible, there are many fruits you can plant that will produce for you each year. Here are some ideas to make your fresh fruit production a little easier if you have the room. Back in the 1960`s my in laws planted an apple tree in their backyard. Today, 50 years later, that apple tree is healthy, alive and producing very well. We pick bag loads of apples every fall. Their tree produces enough apples for not only the entire family, but practically the entire neighborhood. Not bad for a 50 year old tree. They also have a pear tree that is just as old. Fruiting trees are of course one of the first options that come to mind. And with the various dwarf and columnar varieties, you have plenty to choose from if space is limited on your property. Next lets talk about bushes. Again your options are limitless. I have 4 blueberry, 3 blackberry and 7 raspberry bushes. Now you might think that takes up a lot of room, but believe me they don’t. I have situated them in such a way where they get plenty of sun, but are not in the way of the use for other things in my yard. All three varieties are prolific when it comes to production. 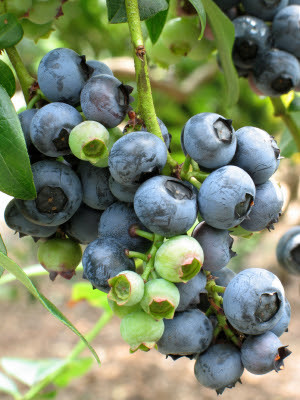 Along with trees, fruiting bushes are great options as well. While they take up a lot space, you will get fairly good perennial production out of grapes. I have three grape vines planted on the back end of my yard. They are doing fairly well there in moderate sunlight and come back stronger each season. They won’t produce enough to make my own wine, but grabbing some fresh grapes to munch on in your backyard, to me, is a great treat. Finally, while not a fruit, but I wanted to get it in here, is the planting of asparagus. If you like asparagus, then you must make it a part of your perennial garden. When planted properly, asparagus will produce for up to 15 years, although 10 to 12 is more likely. I have 6 asparagus plants and plan on adding 6 more next season. I love grilled asparagus. If your area is like mine and temperatures decrease as you head into the autumn months, then right now is the time to get those fall weather crops going. There are many choices, but here are three that are my personal favorite. If you are a fan of growing your own spinach, then you probably grew spinach in the early spring. Have no fear. Spinach is a great fall crop as well. Actually, most leafy green veggies do great in the fall, but I love spinach and wanted to highlight it here. Not only does spinach tolerate the cold, but it grows rather quickly and is shade tolerant which helps as the days get shorter. Use a cold frame and you can even get spinach to grow in the winter months as well. Germinate your seeds now since the temperatures are a bit warmer. Spinach requires light watering, and since spinach is a prolific veggie, you can just plant a few to suffice. Swiss Chard is another great choice. This versatile plant does well in a variety of temperatures including the cold. With so many Swiss Chard varieties to choose from, you can either plant for their leafy greens or turn your fall garden into a rainbow of spectacular color that is edible. They require a bit more water than spinach, but still not too much to make watering a burden. You can plant your swiss chard as close as eight inches and get excellent results or further apart which makes it easier to harvest not only the leaves but down to the stalks as well. I love growing radish. The more the merrier. They are easy to grow from seed and within as little as 4 to 5 weeks, you can harvest them and add to a salad or your favorite dish. Radish grows that quick. There are a myriad of choices when it comes to radish from mild to the super hot. While you can plant your radish seeds as little as two inches apart, I would recommend four inches. I found that two inches was just a bit too close for my liking and four was perfect. 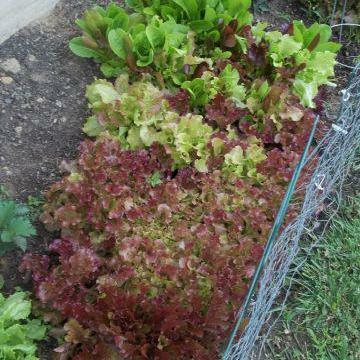 If you really want to save on space, plant rows of radish in between your rows of lettuce or spinach. You will be able to save on space and not hinder the quality or productivity of either plant. Other veggies that you should consider are all lettuce varieties, carrots, parsnips and onions to name a few. Regardless of which ones you go with, start now. You won’t regret it.